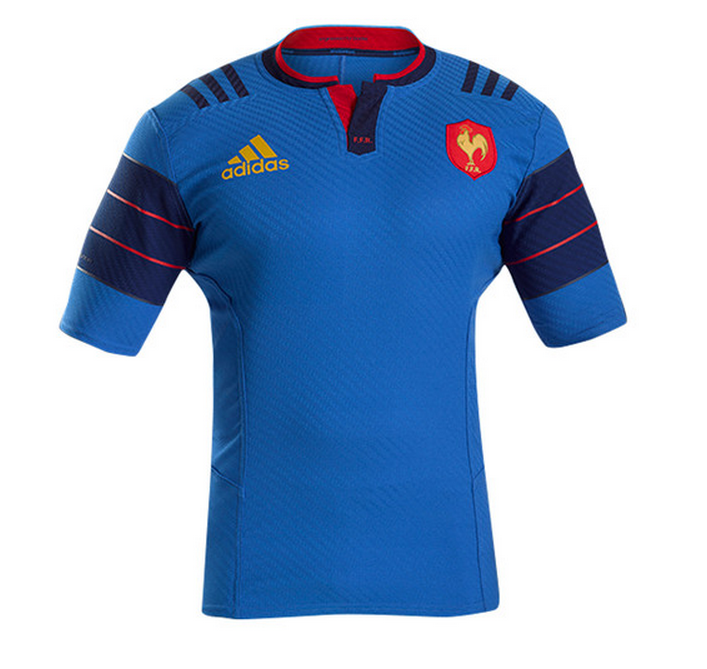 Last year’s France shirt from Adidas was a pretty classic-looking affair, despite a wealth of unconventional elements. This time around, well… things are definitely unconventional, but we’re not sure about classic looking. The first thing that stands out is of course, the colour – for the last decade or more, France have generally had home shirts that are primarily a darker shade of blue – from an almost midnight blue in the Nike era to a more royal shade over the last few years with Adidas. This, on the other hand, is a much lighter, much paler shade. We’re not entirely sure why Adidas and the FFR have chosen to make this fairly radical departure, but it’s certainly eye-catching. We’re not sure we like this colour quite as much as the more classic royal blue, but it feels modern, different, and still pretty classy, too. that’s never a bad thing. Like the new All Blacks shirt, this shirt is made of the same ‘Woven Carbon’ fabric, giving the tell-tale diagonal striped carbon fibre pattern to the shirt. We’re not sure if it’s because of the colour or by intent, but the striping seems less noticeable than it was on the New Zealand shirt. Much more noticeable are the shirt sleeves, which, in Adidas’ words are ‘colour blocked’. In english that just means there’s a big ol’ block of contrasting colour on the sleeves, in this case a much darker shade of blue. We really like it – especially with the subtle red pinstripes bisecting the middle area. It kinda looks a little bit like three Adidas strips who’ve had a few too many half-time pies, but we really like the way it breaks up the simplicity of the jersey with something unusual and eye-catching that we’ve not seen too often before. We’re a lot less fussed on the position of the Adidas stripes. Over the last few years it feels like Adidas have been struggling to know what to do with their iconic three stripes – after decades of being content with running the stripes down over the shoulders and onto the shirt sleeves, over the last few years we’ve seen the stripes twisting up from the back of the sleeve, going across the chest, going all the way around the shoulders, and now, not going down the sleeves anymore, but going over the shoulders like a tiny backpack. We don’t think it looks great, really – it feels like an unnecessary bit of ornamentation on a shirt that already has quite a lot going on with it thanks to those big colour-block sections. 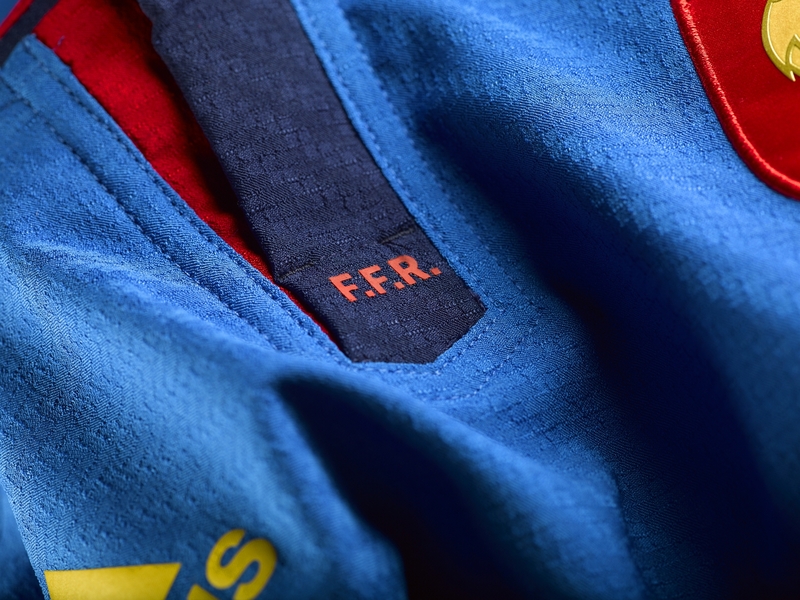 The most common complaint we’ve heard about this new France shirt since it debuted against Fiji is the increased emphasis on red and gold of the FFR badge in the piping and sponsor logo. It certainly gives this shirt a different look to the primarily blue and white affairs of the past, but we think a change can be refreshing sometimes. It’s also worth noting that this shirt has the new Adidas single-button placket collar, which we’d imagine will become an Adidas fixture from now on. 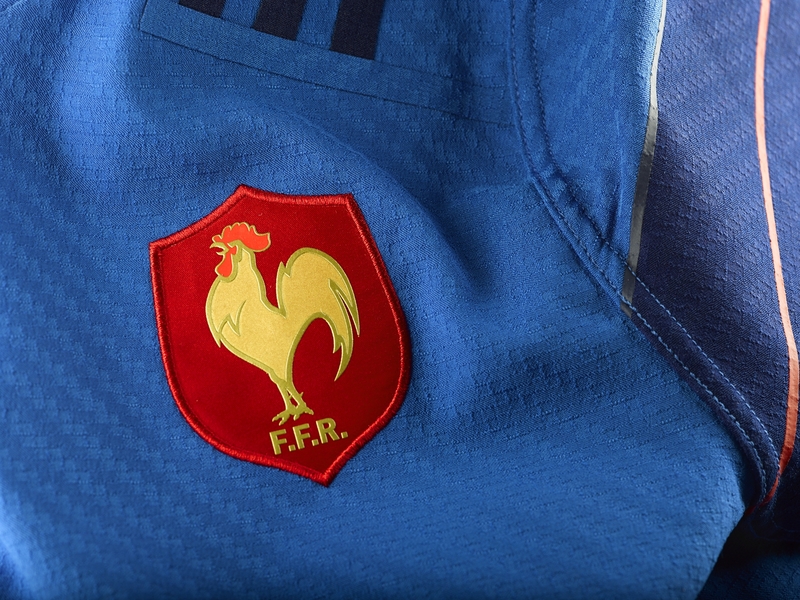 This is certainly not the most traditional French shirt ever, but we can’t help but enjoy the shift to a lighter blue. 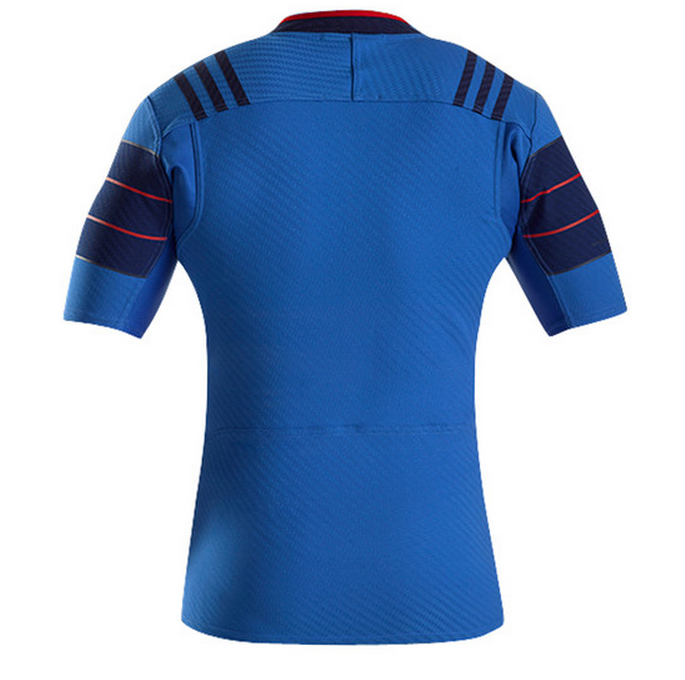 It’s a bit out of the ordinary, and we’re not sure it’ll stick long-term, but if nothing else, this will be a France shirt we’ll all remember for some time. Could you cast some light on the fact that no alternate jersey was launched. Will they be using the last one or aren’t they in need of one this six nations season? New France World Cup kit.